Update: Do your research, this museum might now be closed for restoration or upgraded fire suppression. The Museum of Roman Civilization is an unusual museum in that most of it holdings are replicas, making it appear on the surface to be a bit of a waste of time. But once I had gotten through the first few rooms of the museum I realized that I was seeing replicas of things that I wouldn't otherwise have been able to see at all, and that there were indeed some pretty awesome originals here. 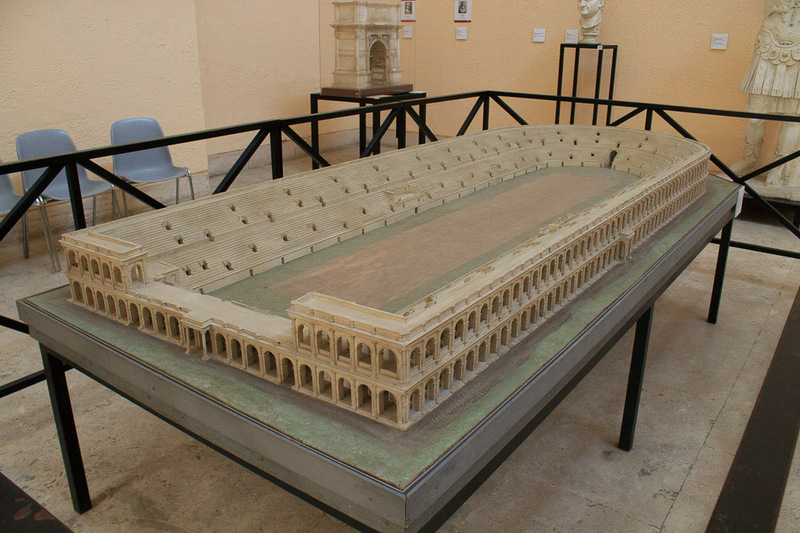 For example, those first few rooms had a copy of busts of Pompey the Great and Julius Caesar which aren't in the other museums in Rome, along with a model of Rome during the Republican era and models of the Colosseum, the Theatre of Marcellus (1st photo below), the Circus Agonalis (2nd photo below), the Ludus Magnus and Hadrian's Villa, all of which illustrated quite well what those ruins looked like back in the day. Additionally, there are three spectacular displays here that make this a worthwhile museum, provided you have the time available. 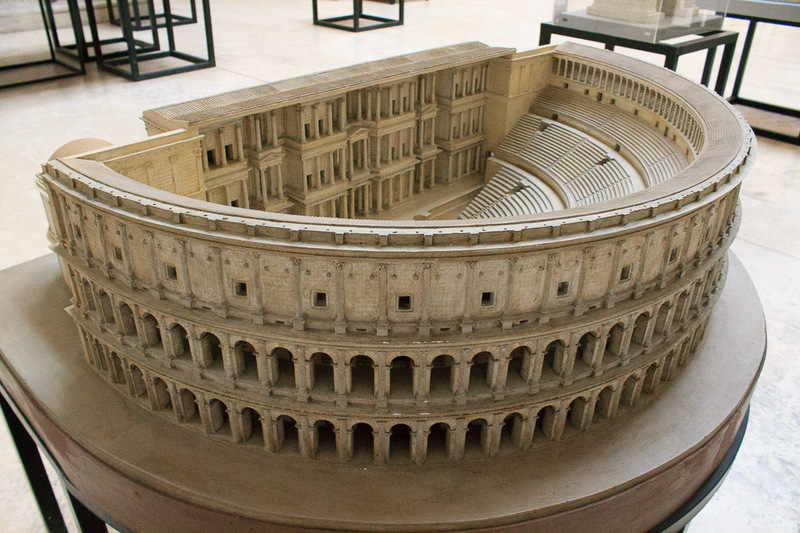 First, there is a very large room (1st photo below) dedicated to Trajan's Column. The real column is too tall to see much detail above the first couple of spirals, but plaster casts were made of the entire column and are displayed such that the spiral is unwound and displayed at eye level. My Trajan's Column Plaster Casts page shows photos of all of these these plaster casts, but they're a whole lot better in person. 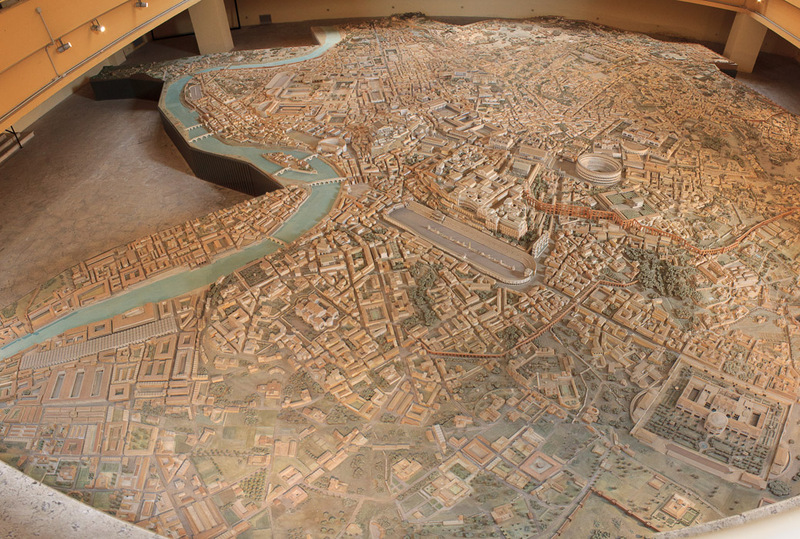 The second highlight is a room-sized scale model of Rome at the time of Constantine (2nd and 3rd photos below). 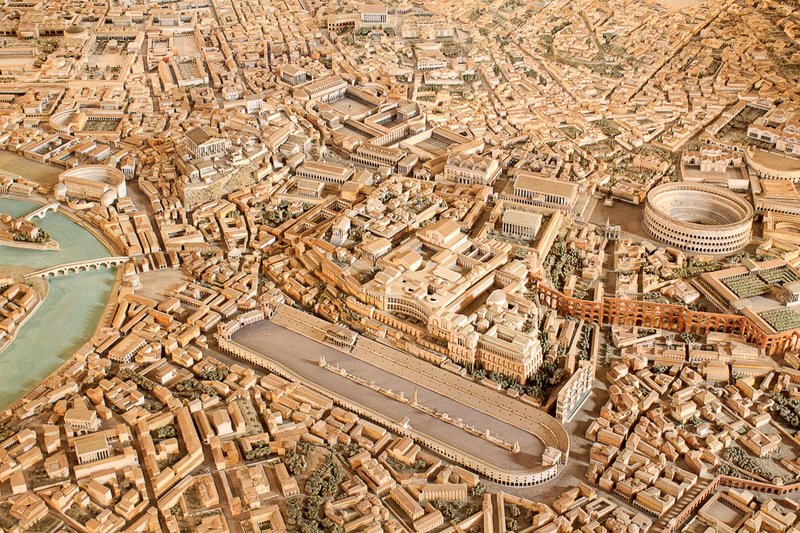 The Roman Forum and the Imperial Fora become much easier to understand if you can see what they looked like when they were still in use, and the same goes for all the other familiar sights in Rome and the neighborhoods in between them which are completely gone today. You can walk around this giant model on the second floor of the museum, looking down at the model on the floor below. 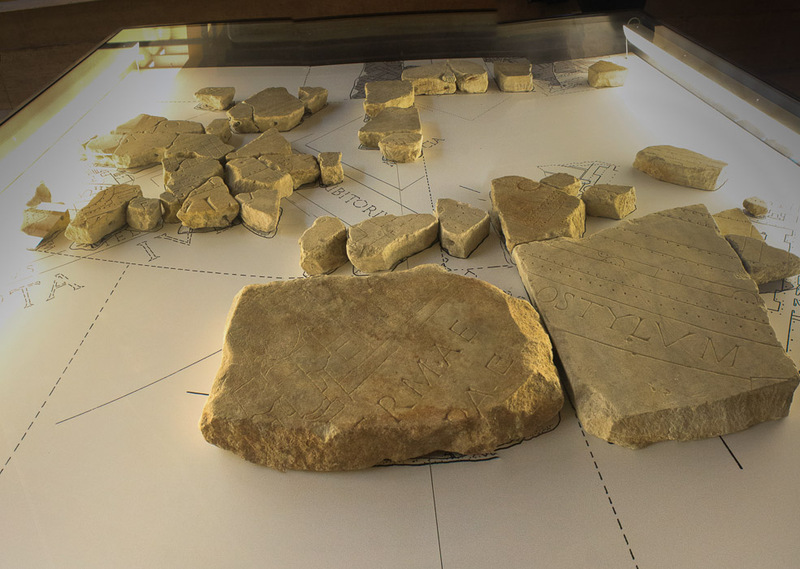 The third highlight is that there are original fragments (4th photo below) of the Forma Urbis in this same room. 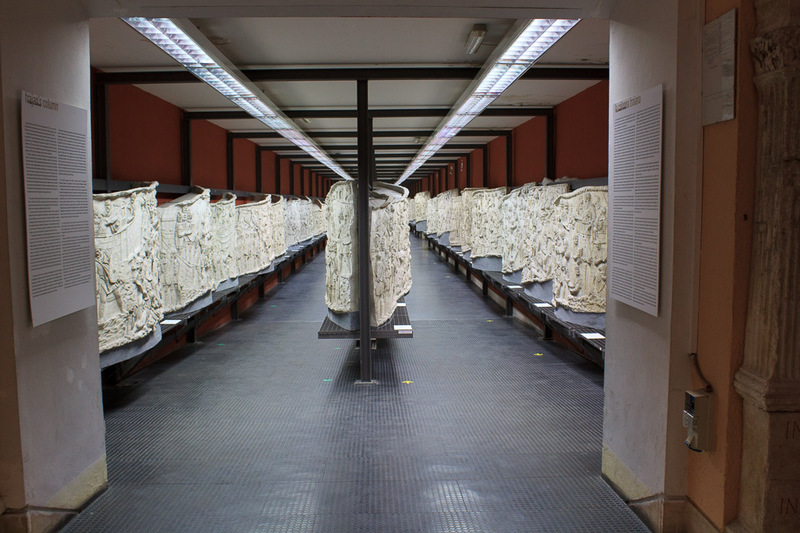 The only other fragments I saw in Rome were at the National Museum of Rome - Crypta Balbi. The Great Trajanic Frieze (1st photo below) is a cast of the four large panels on the Arch of Constantine which were once part of Trajan's Forum. The museum is located in the southeastern part of the EUR district of southern Rome. Ride the blue metro line south to EUR Fermi. Turn right when you exit the metro station, and when that road ends, turn left onto Via Delle'Arte. Turn right at the 4th street, Via della Civita Romana, and the museum is on your right in 2 blocks. When you finish at the museum, walk the opposite direction on Via della Civita Romana until you reach the Marconi Obelisk. Remember which way is a right-turn, then view the obelisk. When you're finished, take that right-turn for one block, then turn left onto Viale Civita del Lavoro, and in 5 blocks you'll reach the Palace of Labor. Continue in the same direction when you're finished, and turn right when you can't go any further to reach the EUR Magliana metro station to head back north toward central Rome and your next destination.